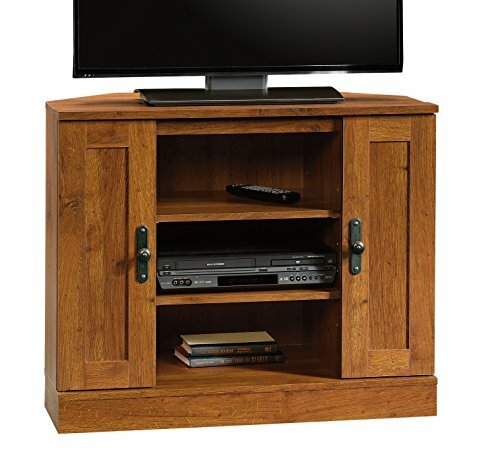 A corner TV stand is a piece of furniture that houses your TV and all the accompanying accessories that go with it. It usually consists of solid wood, MDF, fiberboard, or glass, and either has cupboards or shelves or both. Sometimes, it has an electric fire you can plug into the wall, and you can almost always expect a cable management system to the rear of the unit. The quality differs between all models, and some cater to smaller or larger TVs – depending on the size of the corner unit itself. Even from these variations pointed above, it’s clear to see the market is expansive. If you are in the throes of changing your home furniture, then start with a corner TV stand. Consider these options below. 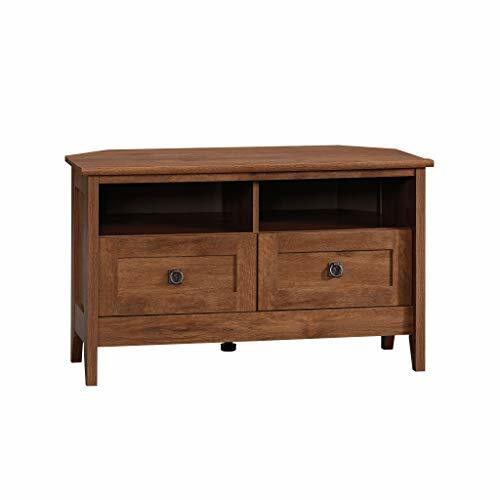 If you don’t have a large TV and, therefore, don’t need a large TV stand, then consider buying this corner TV stand from Bush Furniture. Unlike regular cabinets that stick out in your living room or bedroom, this one tucks neatly into the corner, unobtrusive, but still providing convenient storage for your TV and electronic devices. Its sleek, black color scheme makes it suitable for both contemporary and classic homes, while the wood finish is solid and confidence-inducing. The only downfall here is that you will need at least two people to help you assemble it due to its 64-pound weight. This corner TV stand will be suitable for a TV up to 37 inches, which tends to be what people now have in their bedrooms. The open back design makes it effortless to hide cords, while the tempered glass door means you don’t have to worry about dusting all your electronics. Finally, the storage of this corner TV stand is fantastic. While the TV is sitting snugly on top, there are two adjustable and one fixed shelf for all your electronics, DVDs, and more. While there are issues with quality control, the majority of buyers love this corner TV stand and how it suits their needs perfectly. It’s quite rare to find a corner TV stand that’s both affordable and high-quality, but that’s what you get from Furinno with their black corner TV stand. Even though it’s not the best quality stand on the market, it features robust composite wood, four tiers, and recycled PVC tubes. All of these components are well made and, for installation of them, you don’t need any tools. What will first surprise you is how sturdy this corner TV stand is. Unlike many in a similar price bracket, it has none of the quality control issues that they do. Of course, it’s more prone to scuffing and imperfections than a higher-quality brand, but that’s about as far as it goes. You will enjoy that it doesn’t wobble, that it has several display shelves for your electronics, and that it uses recycled materials to make less of an impact on the environment. Finally, it will please you to know it sits safe and secure in the corner of your house, holding your TV and electronic devices. It’s clear to see this corner TV stand is well worth your inspection. Aside from an exceptionally challenging assembly process and differing colors from the product to your screen, you are still going to enjoy building this corner TV stand to take pride of place in your home. While it can make you work up anger as you struggle to create the drawer and shelving, the result is one that will impress. 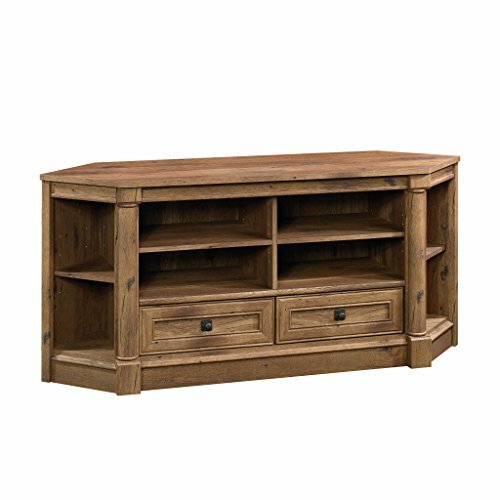 This corner TV stand features Parawood construction, which is a durable, robust rubberwood that lasts the distance. On top is an espresso color finish. However, the screen color of this is vastly different to the product itself. Once you put your TV on top of it, you can then make use of the space below. There is one drawer for all the products you want to keep out of sight, then a shelving unit for all your electronics. Even though this corner TV stand is compact, it still has room for everything. You can also adjust the shelf to fit more or less on it. 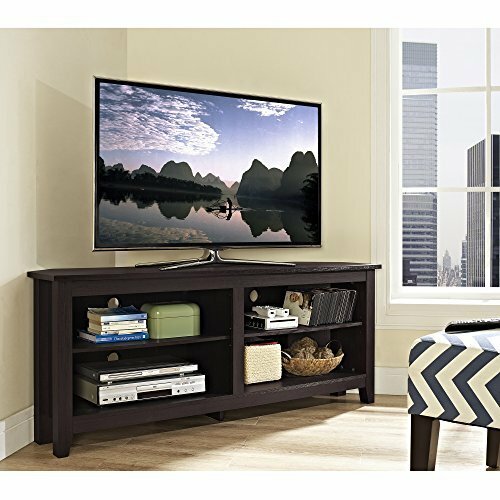 Finally, this corner TV stand is heavyweight at 63.8 pounds, which gives you peace of mind that it features solid wood instead of inferior composite. 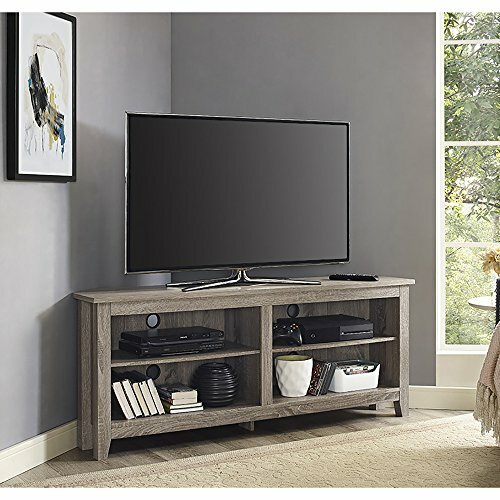 If you want premium quality furniture in your home, check out this TV stand from International Concepts. If a composite corner TV stand doesn’t sound like your cup of tea due to durability issues, then it might be time to spend a bit more and get a solid wood one. This oiled oak corner TV stand could tick all the boxes. Even though you have to assemble it yourself which can be a pain for some people, it’s still a small price to pay. Once you join all the pieces to create the 63-pound stand, it’s going to look incredible. It stands proudly in any living room, has four legs so you can vacuum underneath it, and it has both open and hidden storage to suit most people’s needs. What’s more, it will hold a TV weighing up to 95 pounds, which equates to at least 50 inches, if not more. This corner TV stand is also not overly huge, which adds more space back into your living area. It has two divided shelves for books, DVDs, and other items, and then two handles to open a cabinet-like structure. Here, you can store anything you would prefer didn’t get dusty. Sealing the deal is the inclusion of a generous five-year warranty, covering you for any manufacturer faults. If you want to break away from a corner TV stand, which tends to be the most common option, then how about a glass one? This sleek, stylish, and contemporary stand from Ryan Rove is bucking the trend in many ways. Instead of wood, it features tempered, beveled glass that’s both safe and stylish. Between each layer of glass, it’s supported by metal legs with powder-coating to stop them from rusting. This corner TV stand won’t move around and wobble, nor will it take up a lot of room. It sits in the corner of your room, weighs 65 pounds, and takes up 44 x 24 x 22 inches of space. The top shelf can hold a TV weighing up to 250 pounds, while the bottom two shelves have seven and ten inches of space for all your accessories. To the rear of the unit is a cable management system, and this will ensure you don’t have a corded mess on your hands. Even though this corner TV stand is different from most others, it’s pleasant in its styling. MDF is not the most robust material when it comes to a corner TV stand, but in the case of this one, it’s all you need. What’s more, because it’s not solid wood, it doesn’t cost the earth to buy. 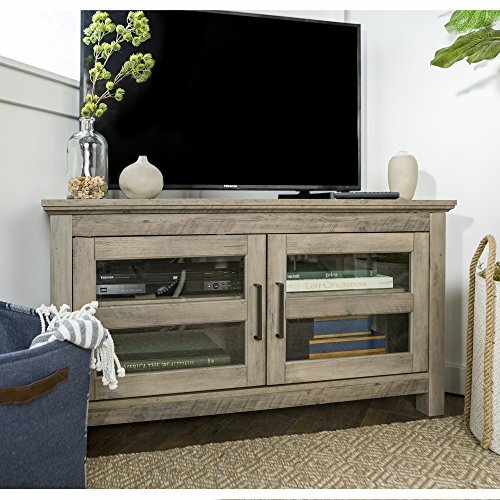 Along with the MDF, this corner TV stand has a laminate coating with a textured, driftwood finish. In any classic or contemporary home, it’s going to look the part. Even though you would buy this corner TV stand for a TV up to 60 inches in size, you would also buy it for its heating capabilities. Alongside six shelving areas, there is a large plug-in electric fire insert which will be a welcome addition to any living room. Watch TV while enjoying the ambiance of a crackling imitation fire. Then, enjoy filling the adjustable shelves with items and storing all the cables out of sight thanks to the cable management system. 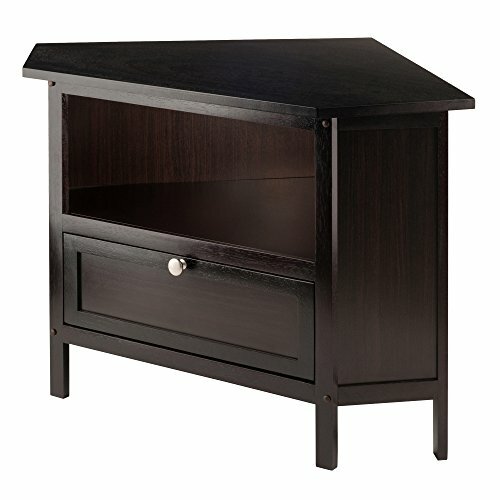 This corner TV stand might not be the best on the market, but it’s unique, and that can help seal the deal. When it comes to the best corner TV stand on the market, you will quickly discover that this is not it. It has storage for 52 CDs when CDs are no longer commonplace, it doesn’t feature solid wood, and it will only hold a TV up to 35 inches when many families are choosing more extensive options. Fortunately, however, there is still a lot to love about this corner TV stand. Its natural color finish will see it tie in beautifully to most homes and hotel units, while its three shelving areas in the center ensure there’s plenty of space for everything. What’s more, even though CDs are not as widely used as they were, it’s nice to be able to put your old collection on display. Even though this corner TV stand features fibreboard and wood composite as opposed to solid wood, it imitates wood well. It has all the markings of a genuine unit, as well as the stability and quality to go with it. This is not a corner TV stand of the future, but it’s going to tick all the boxes for some people nonetheless. Aside from inferior instructions which can leave even a DIY genius confused, this corner TV stand is a standout market product. It fits into any home corner, doesn’t take up a lot of room, and has a beautiful cappuccino color finish to accentuate and enhance any home décor. What’s more, it does not lack in the storage department either. There are two storage shelves hidden behind two glass doors with contemporary handles. If you have a lot of clutter but don’t like it being in the open, this is the perfect corner TV stand for you. You can organize your electronics with minimal effort, sits a reasonably-sized TV on the top, and know that it will last thanks to its superior hardware and construction materials. Therefore, even though you have a battle on your hands when you’re trying to put it together, it won’t be long until you’re enjoying it in your living room watching TV. This corner TV stand is not going to impress everyone who buys it, but for those who find the assembly process straightforward and don’t cause any damage to it, it’s going to leave a smile on their face. 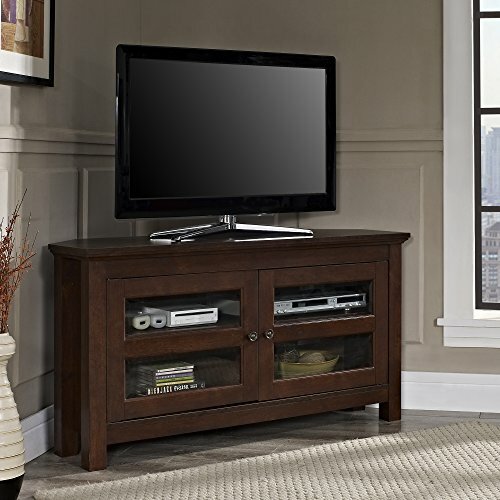 This corner TV stand is available in five colors – white oak, espresso, rustic oak, and traditional brown. Instead of wood, however, it features MDF with a laminate finish which is quite thin. As a result, if you go to put anything on it, it will wear it out without too much time at all. However, if you leave this corner TV stand alone in your living room, you won’t have too many problems. It will hold up to 250 pounds of weight and fits a relatively big TV as well. 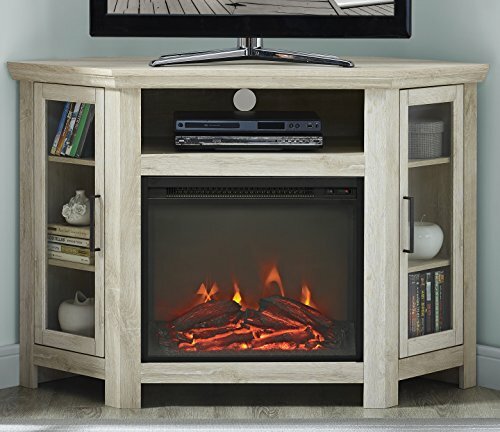 What’s more, it comes with an electric fire insert which adds lovely ambiance while you’re watching TV. If you usually fight a battle against dusty electronics, then this corner TV stand ensures you don’t. The glass doors hide everything out of sight while stopping any dust particles from getting in. For all the good points, however, there are a few other things of which you need to be aware. It’s expensive to buy, notably since it doesn’t feature solid wood. You also pay more for different colors such as rustic oak. Considering it’s not real oak, there is a bit of confusion about why this could be. However, when it comes to style and functionality, this corner TV stand will not disappoint. So, if you’re in the market for a new TV stand, there’s every reason to consider this one. If the time has come to make some upgrades in the home furniture department, then there’s no better place to start than with a TV stand. Unfortunately, if you buy online, you are taking the manufacturer’s word for it that it’s going to fit your needs. To avoid disappointment and possible hassles with returns, consider the following points. The more research you do, the more satisfied you might be with your new TV stand. The price is usually a fairly good indicator of quality. The more you pay, the better-quality materials in use. For example, you pay more for solid wood than you would MDF or fiberboard. If you are on a budget, so you don’t want to spend very much, then you may need to lower your expectations. Unless you buy a second-hand unit, you cannot expect the best TV stand on the market. The materials for TV stands are somewhat the same. Most will use MDF, fiberboard, or glass in the construction process of their furniture. MDF and fiberboard are low-cost options but don’t tend to be that strong or durable. Wood, on the other hand, comes with a high price tag but lasts a long time if you take care of it. Glass offers a contemporary look in your home but can be challenging to keep clean. In most cases, buying your corner TV stand online means you are going to need to assemble it yourself – even those with solid wood or glass. If you want to know whether you are going to have any hassles with this process, then read the customer reviews. If you read a lot of comments regarding inferior instructions and a long-winded assembly process, then add it to your “maybe” list but keep looking elsewhere. A corner TV stand’s job is to hold your TV and store your electronics, DVDs, CDs, and other similar items. The more room it has, the more convenient it will be for your needs. Consider whether you want an open front or a stand with doors. Doors can save you a lot of dusting and hide away clutter, but open storage tends to be cheaper and allows you to display ornaments.